In May, Tzu Chi volunteers in 34 countries and regions held Buddha Day ceremonies to celebrate the three occasions of Buddha Day, Mother's Day, and Tzu Chi Day together. Over 350,000 participants attended the ceremonies worldwide. Everyone at the ceremonies was very sincere and pious, and this was manifested in their orderly movements, which were in perfect accord. It was very beautiful. From this, we can see their harmony, unity and love, for what they presented cannot be done by one person alone. It requires the joint efforts of many people sharing the same aspiration and working together as one. To ensure that everyone moved in synchrony, the participants were willing to rehearse again and again. Through the ceremony, they hoped to show the truth, goodness, and beauty there is in the spirit of religion. It was very touching to see this. The origin of our celebration of the three occasions of Buddha Day, Mother's Day, and Tzu Chi Day on the second Sunday of May dates back to 1996, the year of Tzu Chi's 30th anniversary. Tzu Chi was founded on the 24th day of the third month of the lunar calendar. The anniversary is celebrated based on the lunar calendar, thus falling on different days on the Gregorian calendar every year. 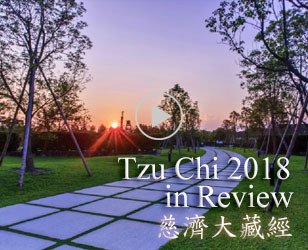 In 1996, Tzu Chi volunteers from the U.S. returned to Taiwan and told us that because Tzu Chi's anniversary falls on different days each year, they had to check their schedules to see if they would be available to come back to Hualien to celebrate. Since the anniversary was very close to Mother's Day that year, we decided to combine Tzu Chi Day with Mother's Day from then on, so there would be a fixed day on which overseas Tzu Chi volunteers could return to Taiwan to celebrate Tzu Chi Day. In 1999, Taiwan's government made the Buddha's birthday (traditionally celebrated in Taiwan on the eighth day of the fourth month on the lunar calendar) a national holiday and combined its celebration with Mother's Day. This is how we have come to celebrate Tzu Chi Day, Mother's Day, as well as Buddha Day all on the second Sunday of May. Our Buddha Day Ceremony started out as a small-scale ceremony held at our Jing Si Hall in Hualien. Over the years, it gradually expanded into the kind of grand and solemn ceremony we have seen in recent years at the National Chiang Kai-shek Memorial Hall in Taipei. Tzu Chi volunteers overseas have now brought this Buddha Day Ceremony back to their own countries. On May 13, 2012, many ceremonies were held around the world. People participated in the solemn ceremony and arranged themselves into beautiful formations, such as bodhi leaves, lotus flowers, the Tzu Chi logo, Dharma ships, and the number 46 to mark Tzu Chi's 46th anniversary. In Taiwan, ceremonies were held in Hualien, Taipei, and other major cities as well as in smaller towns. Ceremonies were also held abroad, in the Philippines, Singapore, Malaysia, Bolivia, United States, France, Indonesia, South Africa, China, Canada, Myanmar, Hong Kong, and Austria. The ceremonies expressed the beauty of religion. Mother's Day is a day to honor our mother, and our parents in general. It reminds us to be good to them and to be filial by caring for them and giving them our love, respect, and appreciation. Our parents gave us life. To bring us into the world, our mother endured many tough months of pregnancy and considerable pain during labor. After we were born, our parents worked hard to raise us. Our very existence comes from our parents, for without them, we wouldn't be here. We should be very grateful to them. The way to repay our parents is to appreciate them and be good to them, and this is the foundation of being a good person. As the ancient Chinese saying goes, filial piety is the starting place for all good deeds. To inspire more people to be good to their parents, Tzu Chi volunteers use the occasion of Mother's Day to promote filial piety. For example, they go to schools to teach students about filial piety and have designed a program to let students play the role of a parent so they can know what it feels like. They have students wear a ball strapped to their stomach to experience what it's like to be pregnant and do chores with a protruding belly. When the students were young, their parents cared for them, changed their diapers, and bathed and fed them. To give them a chance to do something for their parents instead, our volunteers have the students wash their parents' feet in a basin of water. There was also a tea ceremony where students served tea to their parents. Through this, the students learn that in everyday life, they shouldn't expect their parents to serve them water when they are thirsty. Rather, they should be the ones thinking about whether their parents might be thirsty, offering them some water or tea, and being attentive to them in daily life. Many parents were moved to tears when their children served them tea and washed their feet. The students hugged their parents and expressed their love to them. This is a wonderful education that strengthens the parent-child bond. Tzu Chi volunteers in the Philippines held a similar activity to honor parents, where children washed their parents' feet. In this activity, the Mayor of Marikina City himself knelt down to wash his father's feet, to express his respect and gratitude to his father for raising him. It was very touching to see a city mayor setting an example of filial piety for his people. While our parents gave us life and raised us, the Buddha helps us grow in wisdom-life. The Buddha tells us that life is full of suffering, but he also tells us that there's a way out of suffering. Our suffering comes from the impurities in our heart, such as greed, anger, and ignorance. The Buddha teaches us how to take care of our heart and mind and cleanse away our inner impurities, so that we can return to our innate pure nature, the Buddha nature. He teaches us to love one another and to do good deeds to help people unconditionally. The Buddha teaches us about life's principles, guides us to have the right direction, and leads us onto a very bright, smooth, and broad path in life. This is why we are very grateful to the Buddha. If the Buddha had not come into this world, there wouldn't have been Buddhism, and we wouldn't have been able to benefit from his teachings. As Buddhists, we celebrate Buddha Day to commemorate the birth of the Buddha and to let people know that the founder of Buddhism is Shakyamuni Buddha. It is also an occasion to open the public's eyes to Buddhism. The Buddha teaches us to open our hearts and embrace all people no matter their religious faith. Because of this, in our Buddha Day ceremonies, Tzu Chi volunteers not only invited Buddhist Dharma Masters but also leaders of other faiths, such as Christian, Muslim, and Taoist clergy. At the ceremony, people of different religions opened their hearts to join together in praying for the world with sincere piety. In the predominantly Catholic country of the Philippines, for example, of the 15,000 people who attended Tzu Chi's celebration of Buddha Day, Mother's Day, and Tzu Chi Day, ninety percent were Catholics while others belonged to other Christian denominations. Very few of the attendees were Buddhists. Yet, everyone attended the celebration together. This is because for years the Tzu Chi volunteers there have been carrying out work to help poor people in the local communities. With the sense of gratitude, respect, and love that the people had developed toward Tzu Chi, they were very willing to come when invited to the celebration. At the heart of religion is the spirit of love, tolerance, and openness of heart where there is no discrimination based on race, ethnicity, or religion. In our Buddha Day ceremonies, it was remarkable to see people of different religious faiths all coming together in a harmonious and beautiful ceremony. It truly manifested the beauty of the all-embracing spirit of religion. The third occasion celebrated is Tzu Chi Day. Tzu Chi's work follows the Buddha's teaching of practicing the Bodhisattva Path, and also opening our hearts so that we can care for all people with gratitude and respect and work in harmony with other religions in this cause. 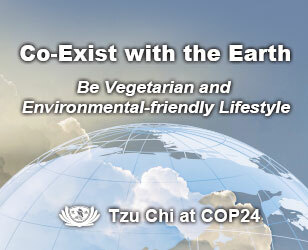 Tzu Chi Day symbolizes our gratitude to all living beings. It is a day of gratitude to all people in society whose labor and giving make our lives possible. It is also a day to especially remember our fellow volunteers. Without everyone's joint efforts, Tzu Chi would not be able to help people in over 70 countries and carry out the missions of Charity, Medicine, Education, and Culture. 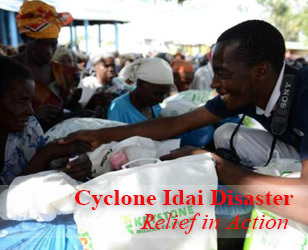 With Tzu Chi volunteers in over 50 countries caring for people in their local communities, many people's suffering can be alleviated, and in times of disaster, we are better able to reach people who are in need. Indeed, without everyone, Tzu Chi could not be what it is today. Tzu Chi Day is an especial time of gratitude. All around the world, Tzu Chi volunteers are very mindful in dedicating themselves to working for Buddhism and for all living beings. In May each year, they especially do this by holding Buddha Day ceremonies. No matter if the ceremony is a small and simple one or a large-scale event, everyone is equal in their heart of sincere piety. The ceremony itself is only held once a year, but through it we remember to have the same pious sincerity always, all through the year. In celebrating Buddha Day, Mother's Day and Tzu Chi Day together, we take part in an occasion that reminds us to purify our hearts, appreciate our parents, and do good deeds to benefit our fellow human beings. At the ceremony, we pray for the world—we pray that the hearts of humanity may become pure, society may have peace and harmony, and the world may be free of disasters. May there be a wide celebration of these three special occasions every year to help us renew our vows to work for the good of all living beings and create a better world.